The name itself talks about the famous festival of colors. Holi is celebrated across India. What is so special about it? since it may turn out to be a great part of someone’s travel to Assam during the Holi (which falls in the month of march). This year the festival of Holi at Barpeta was celebrated in 1st and 2nd week of March in every year. I hope some of you can catch it the next year for some memories for a lifetime. 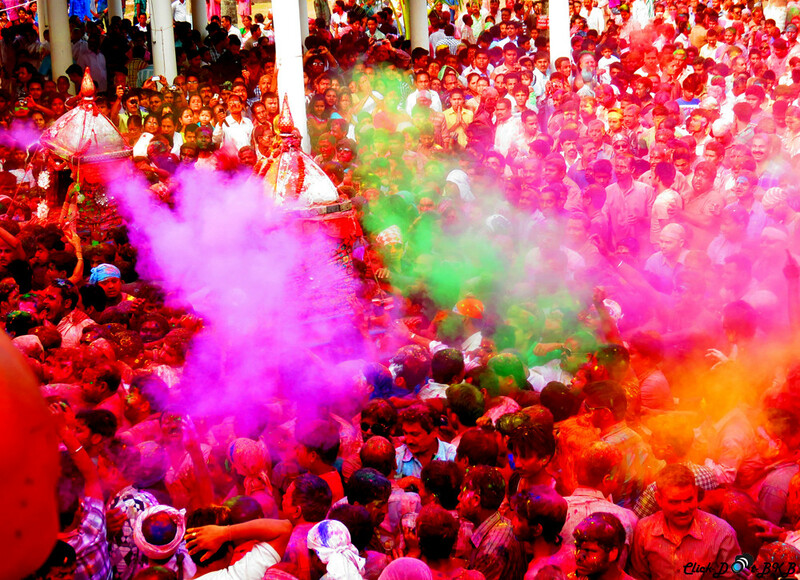 Like the rest of the country, Holi is also colorfully celebrated by the people of Assam. It just gets more tremendous an occasion for the people of Barpeta. In Barpeta, the festival is called ‘Fakuwa’ or ‘Doul Mahotsav’. It is a festival of happiness. During this festival, the people of Barpeta forget their sorrow and agonies. They celebrate this festival with traditional gaiety and enthusiasm. Barpeta is a small town of lower Assam, 100 KM west of Guwahati, the state capital. Barpeta is the hub of “vaisnavate” culture of Assam. All traditions and culture are based on the 600 years old vaisnavate philosophy and surrounded by 550 years old vasnavate monasteries of barpeta called ‘Barpeta Satra’ (सत्र, अधिवेशन). Barpeta town is always referred to as the Dwarka and Mathura of Assam. Barpeta Satra is also called Ditiya Vaikuntha Puri (the second abode of Vishnu, the second heaven). At Barpeta Satra, Mathura Das Bura Ata ( 1st Satradhikar- head of Satra institution, the monastery) first celebrated Doul festival in the model of Vaikuntha (heaven) because Holi was first celebrated in the heavens by Sri Krishna. Thereafter, Doul festival is celebrated with Satriya parampara (traditionally) till today at Barpeta Satra. The Doul festival is celebrated for 3 to 5 days. The 3-day Doul is called “Burha Doul” and four or five days Doul is called “Deka Doul”. Burha Doul fall in the Assamese month of ‘Chaitra purnima’ (2nd half of march- full moon) and Deka doul fall in the Assamese month of ‘Fagun Purnima’ (1st half of march – full moon). All 3 to 5 day festivals basically celebrate the wedding ceremony of Sri Krishna and Rukmini. The first day is called Gandha. It’s just like the engagement ceremony or jaimala reception of the traditional marriage ceremony. In the day time, the idol of Koilababa (Sri Krishna’s local name) and Rukmini is brought out from the prayer hall (manikut). They are made to wear new clothes and ornaments, just like an engagement ceremony. After that Koilababa and Rukmini are brought near Meji (meji is bonfire, same as the Holika dahan of North India) and after alighting the meji, Koilababa takes seven rounds around it. It is called meji puoa or magh puoa. People believe that, that the winters are on their way out. Atachbaji (Fireworks) or Phanuch (flying lanten) are the main attractions of Gandha. All firecrakers are locally made and have a huge demand across the country. Koilababa is then brought to Jagmohan Ghar (a special house) after Meji Puoa and on a sacred moment in the night Koilababa is brought to Doul Ghar in a special walk of seven steps (Sapta Thak) while the people of Barpeta sing the holigeets (holi songs) with great enthusiasm – making the scene as perfect as that of a jaimala. The bride and the groom are kept there for the people to come and take blessings from. The second day is called Bhar Doul. which always falls on the fullmoon day (starting from the first day of the full moon, the celebrations may continue to 2nd or 3rd depend on days of festivals). These days are celebrated traditionally and Koilababa and Rukmini remain on the Doul for public blessings. The last day is called Phakua or Suweri. This is the day for people to play with colour and roam around the town. There is no end of joy for anyone. People of every age and gender celebrate with the same joy and fervour. If you are a tourist and not playing holi, people will not throw a single drop of water to you. Women are treated with utmost respect and no one throws colour on any women if they don’t play holi. In the evening, Koilababa and Rukmini are brought down from the Doul and taken out in a beautifully designed asana, or you can say dola. People take them for full seven rounds of the Namaghar, like the saat-phere of a hindu marriage. After completion of the seventh round, Koilababa and Rukmini are taken back to their original place in Manikut (inside the prayer hall). After that the Daba (a big drum) beats 108 times and thus ends this famous Doul festival of Barpeta. It is very difficult to capture all the joy in a single write-up, if you visit you can feel the joy of Holi – a somewhat different festival of India. This was just a brief description about the festival, not a usual journey. Mostly on Holi, one sees Holika-dahan and the colour play, but in Barpeta, you get to see a very thick streak of pure joy with colour. Barpeta is well connected by National Highway 37 and State Highway from Guwahati. It is around 100 KM from Guwahati (two and a half hour journey). Guwahati is very well connected by air and rail. Nearest Railway station is Barpeta Road (18KM), where all trains may not stop, but you can look for “New Bangaigaon” station (56KM), where every train stops. March is moderate temperature and good enough for the celebration.